3.6 out of 5 based on 53 bloggers and 35 commenters. 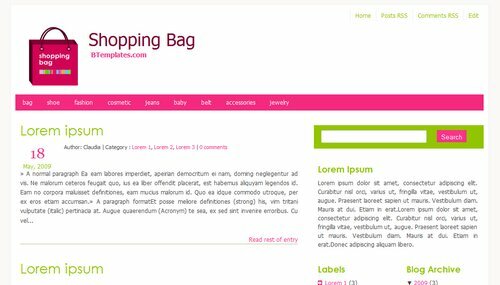 Shopping Bag is a free blogger template with 3 columns, left sidebar, web 2.0 design, posts thumbnails and girly looking. Excellent template for blogs about business or fashion. I’ve got some problems with the calendar and I hate that “Read the rest…”..How can I see the entire post without that? good one, but i don’t like the color pink and green. I did it and it is working ! If you have a problem,please tell me. I did it now and it is working (the date). Sorry i am french. I’m trying to be clear. I hope it is ! i’v got problems whit the calendar. How can i fix it? i read the instructions… and nope. @Arianna The instructions link is above (just click it). Change the HOUR format, not the date. Thanks. I am using it on http://www.shopgrifters.com. It takes a while to get everything setup, but it is a great way to organize your pages so it looks like a regular webpage. hi, i uploaded it and over my post it says Undefined twice how do i fix that? I love this…thanks for sharing it! hi, i have a problem using the site in firefox, chrome and IE8, they seems to be kinda mess when i checked the site using other browsers. Is there a fix on lists menu options? hi, how can i remove the “read the rest of the entry” and show the entire post on the main page? Great template, I was able to customize as needed. One question. For the footer, I want the content spread out or at least centered. Instead, everything that is in the bottom cell that is the largest, is aligned to the right. How can I center the contents? One more question….is there a way to control how much of the original post is on the front page? I would like to shorten it slightly. O template esta perfeito o unico problema é o formato da data da dá erro. Hi, i keep getting ‘undefined’ when i post new content. Please can you help me. undefined is under the title and in the area where the post/content should be. I am using firefox. I love this layout and I’m using it for a time now. But I’ve got a big problem: the older/newer post link isn’t working right in every blog that uses this template! It’s appearing in the wrong place and I don’t know how to fix it. I solved the “Postagens recentes/Postagens anteriores” problem, but now I got a new problem lol I mark to show 24 posts in the front page, but it only shows 7. Anyone knows the reason why this happens? Tengo problemas con la fecha en los posts, me sale UNDEFINED, quiero eliminar la fecha para que no aparezca, cómo le hago? ?, gracias, espero tu respuesta. Do you have a version of this template for WP?? I have a problem with my navigation bar eg Next, Previous, Home. They appear to be in a narrow column with my 2 columns on top. Can you advise how I can correct this. Hi! I loved the template it’s simple and pretty. But, I am experiencing the same problem too for the NEWER POST, OLDER POST and HOME. They are appearing clustered and showing near the SEARCH button. I wish they can be put under my entry or perhaps after the comment link. I’m trying to read thru the codes but I cannot find it. Please help. Same here.. Can you help me fix the navigation bar please? Home. Newer Post and Older Post are all messed up and covered by the Search Box.